Running at high altitudes poses both challenges and concerns. The air at higher altitudes is the same as air at all altitudes, but a drop in barometric pressure affects the way the oxygen in the air enters your body. The drop in barometric pressure decreases the amount of oxygen intake in each breath you take. To compensate for the decrease in oxygen, your body's natural reaction is to breathe more rapidly in an attempt to take in more oxygen. Several techniques can help you overcome breathing difficulties at higher altitudes. A technique called pressure breathing can help you increase the amount of carbon dioxide you exhale while running. Purse your lips and exhale as deeply as possible. This releases a higher amount of carbon dioxide from your body with each breath. The greater release of carbon dioxide from your lungs allows for an easier exchange with the oxygen in the air. Because evaporation occurs more quickly at higher altitudes, you may find it more challenging to determine the amount of fluid released from your body. Your sweat will evaporate more quickly, so you may not notice the amount of fluid leaving your body. When running or doing any form of exercise at a high altitude, drink plenty of fluids. 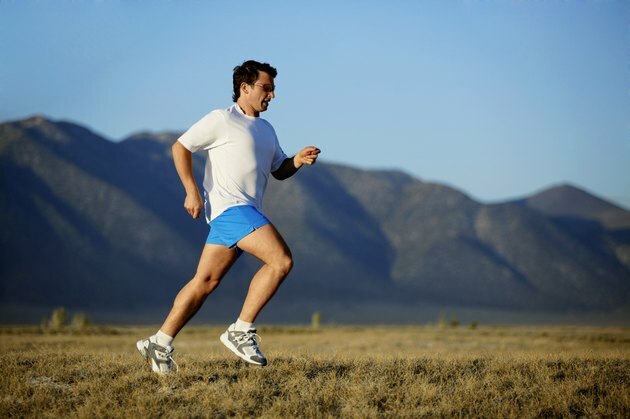 Eat more carbohydrates when you run or exercise at high altitudes. Carbohydrates need less oxygen than protein to metabolize in your system. This provides the ongoing nutrients and fuel necessary at high altitudes. The rate of your metabolism increases the first few days you live at a higher altitude. Because of this, your diet should also include more fat until your body acclimates to the change in elevation. Before travelling to or exercising at higher altitudes, consult a nutritionist or speak with your physician. If you do not normally live at high altitudes, do not immediately pursue a workout when you get a such an area. When you do begin exercising, begin slowly. Your body will behave differently at higher altitudes. Be aware of any changes in your body. If you do not feel like your normal self after a few days in the mountains, return to a lower altitude. Do You Burn Fat Running for 30 Minutes? How Many Carbohydrates Are Burned Running? What Causes Shortness of Breath When Running? How Long Does It Take to Acclimate to Elevation When Running a Race? How Much Do I Have to Run to Lose 15 Pounds? What Happens to the Breathing System When We Exercise?